“I think we should get a new sofa.” I casually said one evening while lying uncomfortably on our old on. This one small comment lead to us moving house, and no I’m not even remotely joking. But that’s how it always starts. A simple thought like “I’d love a new oven.” can lead to an entire kitchen refurb. A broken shower can often lead to a whole bathroom refit. It’s how any building job starts, a simple need and before you know it the back of your house is being propped up by acro’s (those big steel telescopic poles that prop up a floor when the walls have come down). So we moved house, did a ‘mini-refurb’ which made the house liveable until we could afford the big one. 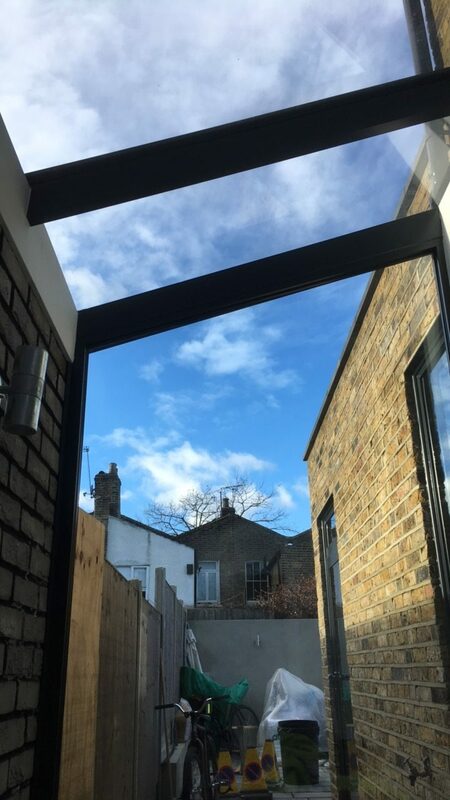 The ‘big one’ involved a full side return extension on our Victorian Terrace house in East London. 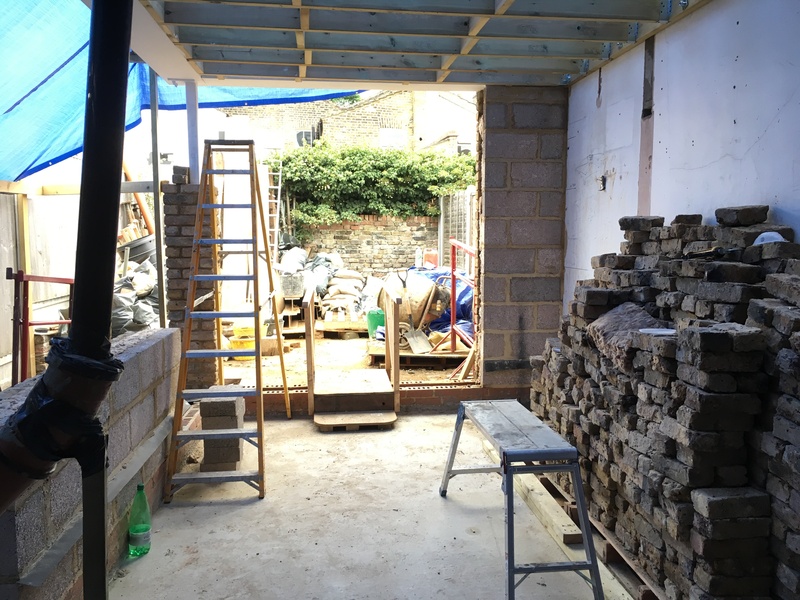 A side return as it’s commonly referred to, involves changing the back narrower section of a terrace house (usually where the kitchen is located) to become a wider section meeting the neighbours wall. This can allow you to open up a kitchen to create a living/dining/kitchen space. It’s a very common extension on a terrace house and a great way to modernise and create a larger ground floor area. As a so called expert it was interesting being a client on this level of refurbishment. In a series of posts I will outline my experiences in order to give you a guide on what a building our project was like and what you need to know to manage your own. Follow the hashtag #ayearinthelifeofarefurb to keep up to date with our progress. This project started typical with a simple, relatively straightforward extension in mind and perhaps a ‘bit of decorating here and there’. In reality we ended up refurbishing the entire house, including a bathroom that had only recently been refurbished. The phrase “while we’re here we may as well…” saw us increase our budget by about 25%. So my advice before you start, don’t limit yourself plan big and then scale back. Start with your blank sheet of paper and write everything you could possibly want to do in your house as if money were no object. Then work on what you can afford to do and prioritise from there, this allows you to really limit the surprise jobs that spring up throughout the course of the project. You will work around the things that you really know you don’t want to do or can’t afford to do. Working this way allows you to set a realistic budget from the outset and gives you a real sense of what you absolutely will not be able to do. It’s easier to right it off before the project starts then in the middle of the project when it’s easier to get carried away and before you know it your budget has spiralled out of control. You should now have a rough idea of your budget and at this stage but remember it’s still a very loose self-allocated budget, the figures are likely to change again once you have spoken to an architect and a builder. It is vitally important to add a 20-25% contingency to any budget, this is to allow for things that cannot be foreseen, problems with pipework, delays, weather issues etc. It is better to write in a large contingency and not use it, then have to scramble around for cash or worse have to cut back your plans if something does go wrong. Once you have an idea of what you want to achieve you can have a little fun collating ideas and inspiration. Social media is excellent for this, but remember not every image you see if a picture of reality. That being said, this is your opportunity to go a bit crazy and have some fun. Create Pintrest boards for each room or feature and add in anything you see that you like, and follow hashtags of property refurbishments on Instagram, save anything to your collection that you like the look off. These are essentially mood boards to be able to show architects and builders what your style is and what you are hoping to achieve.